Bogota, Feb 3 (Entravision) .- The British company Holdtrade confirmed today that participate in the renewal of the Colombian rail system with an initial investment of $147 million in a railway route that connects the center of the country to the Atlantic coast. The announcement was made in Bogota the president of Atlantic Holdtrade, Diego Martinez, in an act which was attended by the British deputy prime minister Nick Clegg, who today made an official visit to the country in order to promote trade, investment and cooperation. “Without a modern infrastructure, particularly transport, it is very difficult to grow,” said Clegg, who emphasized the good moment for the passing through the relations between the United Kingdom and Colombia, both at the level of Governments and companies. 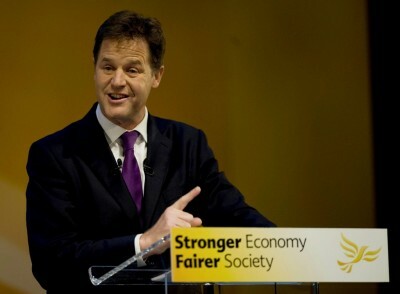 Clegg assured him that he agreed to “will be a significant investment that will last many years”, since it provides for “open new routes of rail transport which will be used to carry the goods for export to the ports”. Holdtrade’s investment will be mainly devoted to commissioning of a modern fleet of locomotives for the transport of cargo in the path between the Golden, in the department of Caldas, center of Colombia, and the Caribbean port of Santa Marta. The new trains, which are expected to start shooting next year, will cost each one around three million dollars, they will operate with diesel fuel or electricity and will have an average speed of between 65 and 70 kilometers per hour. The technology of these locomotives will facilitate the transportation of coal, oil and agricultural and industrial products between the center and north of Colombia. The new trains filmed by the existing railroads that the Government hopes to expand as part of a recovery program of the national network of railways, abandoned years ago. According to the vice president of Operations at Holdtrade Atlantic, Leo Suarez, the old locomotives will be relegated to operations of patios or maneuver, while in the main line “be used latest-generation trains, with extremely efficient motor from the environmental and economic point of view”. After today to conclude its visit to Bogota that included meetings with the president Juan Manuel Santos, with entrepreneurs and directors of social agencies of the Government, Clegg will travel to Mexico, a country which, together with Colombia is considered strategic by the United Kingdom for its economic dynamism.